The NOCTEX Commercial Ballast for commercial lighting features unsurpassed state-of-the-art design that integrates a micro-controller unit with our patented AS-TIM technology for optimal performance, reliability, and energy efficiency. It carries out diagnostics to check for the most favourable striking voltage for the lamp and then supply the lamp with exactly what it needs, preventing unnecessary overstrike and thereby enhancing its life time. Automatic dimming following a preprogrammed schedule is available from 30% to 100% of its original power, which provides additional energy saving of up to 60% over traditional magnetic ballast. Our unique dimming pattern is based on slow and adaptive grounds to ensure roadway safety. Retrofitting is easy and requires no re-wiring of existing cables, making it the most cost-effective energy conservation option currently on the market. Optional Centralized Control and Management System Software greatly reduces labor and operational cost by allowing one to management thousands of lights at a fingertip, some features include real-time electrical feedback, prescheduled dimming, fault detection of individual or groups of lights. 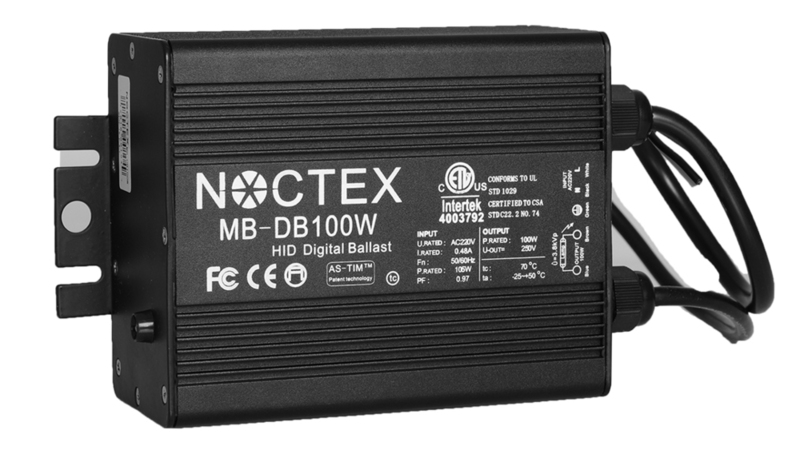 NOCTEX Digital Ballasts offers unparalleled stability, performance and innovation in features that give real world results.